I’ve stumbled upon a few items of interest relating to different Lagoon ventures outside the park. Aside from the obvious one (The Terrace), here is a short list with the few brief details I currently have. With Lagoon’s Penny Arcade simultaneously operating at the park, I have to wonder if some of the machines were used at both arcades at different times. It should be noted that other non-related arcades have been in business at Trolley Square over the years besides Lagoon’s. Another arcade operated by Lagoon Corp. opened in Sugar House in early 1975. As of July of that year, three others were planned in Ogden and Salt Lake City, but the ad below from 1979 shows the only locations in Trolley Square and Liberty Park. Lagoon operated a 1954 Arrow Merry-Go-Round at this Ogden park for an unknown period of time. As of 1984, Lagoon still had it in storage and had placed it up for sale. This leaves me with at least a couple questions. How many concessions could Lagoon have operated outside the park? Were any of the rides at Lagoon operated elsewhere by Lagoon Corporation before or after their time at the park? A clothing line sold at J.C. Penney stores in the area during June and July of 1989. Designed by local artist Martin Blundell to help promote the new water park. The line featured swimsuits, sweatshirts and t-shirts that were specifically designed to endure water, sand and sun. They were later made available exclusively at Rad Brad’s Surf Rags at Lagoon with the possibility of expanding outside Utah if it became profitable enough. Read more about The Terrace. Trolley Square still growing. Deseret News, 14 Dec 1974. Lagoon can turn a frown upside down. Deseret News, 5 Apr 1975. Trolley Square’s new ‘street’. Deseret News, 18 Nov 1975. Saltair improvements debated. Deseret News, 21 Oct 1977. Carrousels: A ride that builds memories. Deseret News, 17 Jun 1984. Lagoon-A-Beach togs are making a splash. Deseret News, 17 Jul 1989. 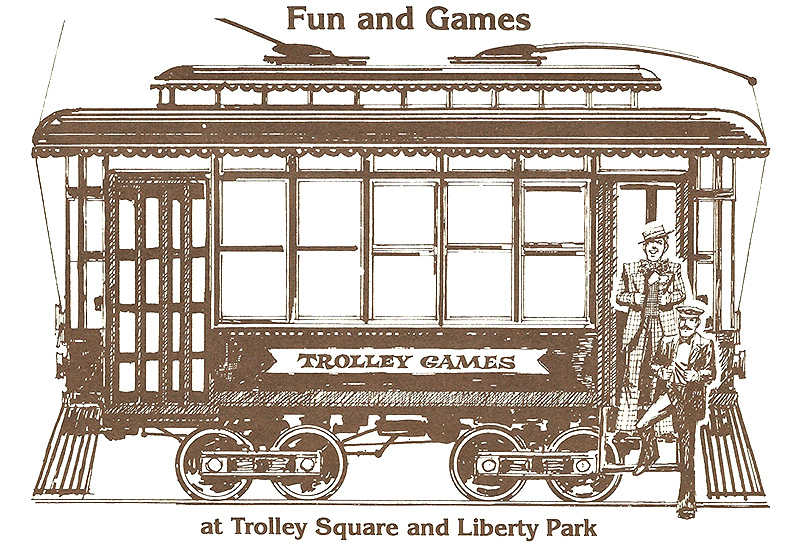 Trolley Square?. Unknown forum post, 8 May 2001. Trolley Square Store Directory. Trolley Square.com, accessed 2 Jan 2011. RE: Lagoon Photos. Message to author from Sam W., 18 Feb 2011.